Gaming “addicts” have been talking to MPs about the dangers of spending too much time online. One told them that parents should set a three-hour-a-day limit on their children’s gaming. It is part of an inquiry into technology addiction, being held by the Digital, Culture, Media and Sport Select Committee. At an earlier hearing, representatives from the gaming industry downplayed the issue. There is no publicly available content from that meeting but, in written evidence to the committee, the association for UK Interactive Entertainment (Ukie) said there was a “lack of evidence” around the concept of gaming addiction, citing both a UN report and one from the Royal College of Paediatrics and Child Health. It also told MPs gameplay could be a “force for good”. “We believe that games can provide educational, physiological, psychological, recreational and social benefits to players,” it said. “Games provide rich story worlds, creative canvasses. But when MPs asked gamer Matus Mikus whether parents should set time limits, he said: “I would say first that parents need to talk to their children, as each one is different, but I’d say that three hours at most per day. More than that is when it starts affecting you. Gamers were encouraged to compete for points or earn rewards for games, he said. “Sometimes I’d come home and I’d want to go to bed but knew I had points so had to play a game and then if I lost I had to play another game,” Mr Mikus told the MPs. James Good, a fellow self-confessed gaming addict, then told them how, at his worst, he had spent 32 hours gaming without a break, while he was at university. “I was falling behind, my grades were slipping as a result of playing too many games. I didn’t eat, sleep or leave my room. I escaped my problems via games,” he said. And then he admitted that he had preferred the virtual world of games to the real one. Mr Good ended up dropping out of university in a spiral of depression. He eventually got in touch with Game Quitters, an online forum made up of thousands of people who have turned their backs on games. The forum starts with a quiz to see if the visitor has symptoms of gaming addictions and then sets new members the challenge of giving up any form of gaming for 90 days. And Mr Good told the MPs he had experienced withdrawal symptoms. “I was getting headaches, moods, and I had to lock my computer in a cupboard,” he said. He said that being a member of the forum had helped because people talked about strategies to cope with the desire to play games as well as alternative activities they engaged in. But, Mr Good said, while his story may seem a clear cut case of gaming causing problems, it was not that simple. “Gaming becomes a problem because you let other things slide but it is not the root cause of the problem,” he told the MPs. Although he had also played games as a teenager, it was something that he had combined with an active life, playing sports and attending Scouts. And it was only when he left home to go to university that gaming had become a problem, because he had “lacked discipline” and did not have a parent telling him “to work or go to bed”. Mr Good was then asked whether he thought there was a link between the current rise of knife crime in the UK and the increasingly violent video games being made but he said that he did not think there was any correlation. 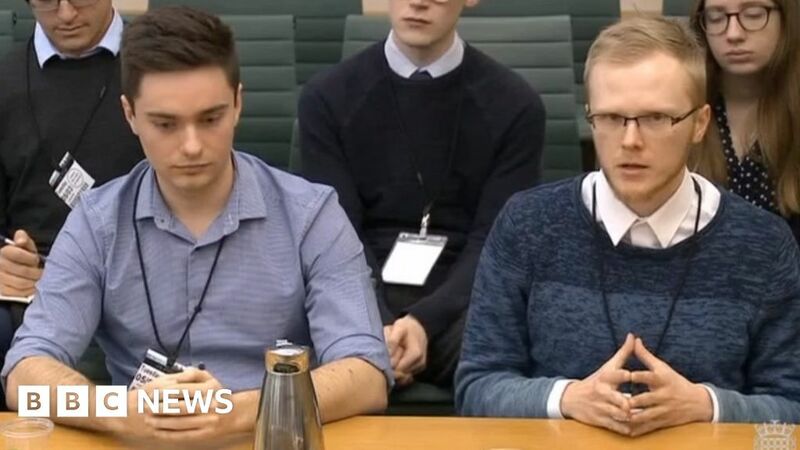 The MPs are also looking into the wider issue of social-media addiction and asked vlogger Jack Edwards about this. But he told them the problem was difficult to pinpoint because social media had become so integrated into daily life. “People can get on with their normal life but they are still checking their phone for updates all the time,” he said. And social media could often be a place for good, opening young people’s minds to “new ideas”. Mr Edwards admitted to a personal compulsion to scroll, checking social media first thing in the morning and after lectures. But he added: “I don’t know if this is a positive or a negative thing.